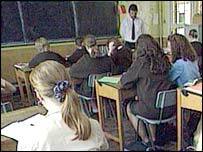 The first schools which will take part in trials of controversial education reforms in England have been announced. Several "trust school" projects have been agreed between private groups and schools, with a total of 28 planned for the pilot scheme this year. Plans for trusts, free from local authority control, drew opposition from rebel Labour MPs earlier this year. But, following concessions, the education bill going through Parliament is expected to become law in November. Education Secretary Alan Johnson said the 28 projects would involve 50 schools. 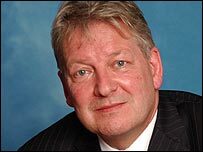 He also named a Department for Education and Skills official, Sir Bruce Liddington, as the commissioner who will match companies, colleges, charities and other groups with schools to become trusts. Sir Bruce would work with the other interested schools to identify suitable sponsors, the department said. The ATL teachers' union reiterated its opposition to trust schools. Among other things its general secretary, Dr Mary Bousted, said: "We are still worried about the make up of their governing bodies which could be dominated by a single group. "There isn't any justification for giving a trust the majority representation on a school governing body. "And we want reassurance that the schools commissioner - an unaccountable bureaucrat in the DfES - will not put pressure on schools and local authorities to get trust schools set up." The education secretary and Prime Minister Tony Blair visited one of the schools - Quintin Kynaston in St John's Wood, north-west London - to mark the announcement. Mr Johnson said: "There is a real momentum gathering behind our reforms. "From today around 50 schools will be exploring trust status as a way of raising standards." He added: "The flexibilities and freedoms that trust status provides will allow school leaders to better respond to the needs of their communities, work in partnership to tackle challenges and to work with parents to shape the direction and ethos of their school." The DfES said more than 60 schools had expressed an interest in setting up trusts. But the general secretary of the NASUWT teachers' union, Chris Keates, said the whole scheme was "highly regrettable". It was "undermining the government's laudable ambition to ensure that all children whatever their background have access to the highest standards of education", she added. Who will run 'trust' schools?